The long-delayed, $150 million, 250,000-square-foot urban mall now known as Market Street Place is slowly rising from an empty hole in the ground. Mid-Market revivalists are rejoicing as, today, developer, Cypress Equities celebrates the groundbreaking groundbreaking on the long-promised development of Market Street between Fifth and Sixth. 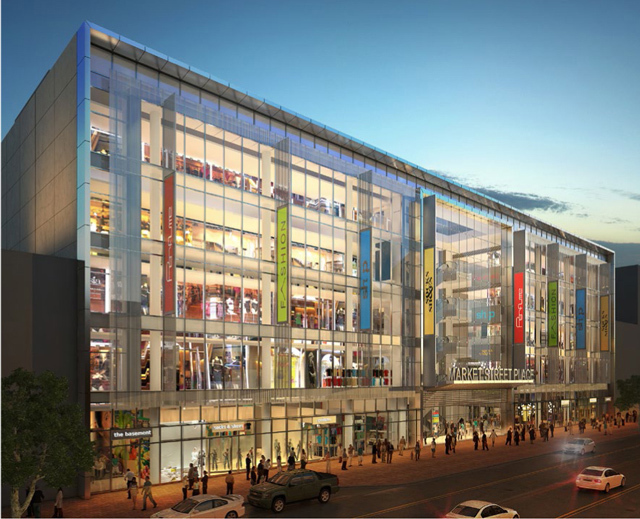 The Chronicle reports that retail tenants will be announced in the coming months and that the gleaming behemoth will draw its first breaths customers in July 2016. Target, JC Penney, Nordstrom Rack, and Marshalls were originally courted but all have passed on the development formerly known as CityPlace. After years of delays, construction was targeted for two months ago but finally kicked off today — and the project's many setbacks appear to be all in the past for the optimistic Cypress Equities, who bought out their partner firm for the project and are quoted as having a "great mix" of interested tenants. Market Street place is slated to contain two floors of food courts markets: one on the fifth level and a second in the basement. Guess who's pumped to go shopping and knows how to use a shovel!